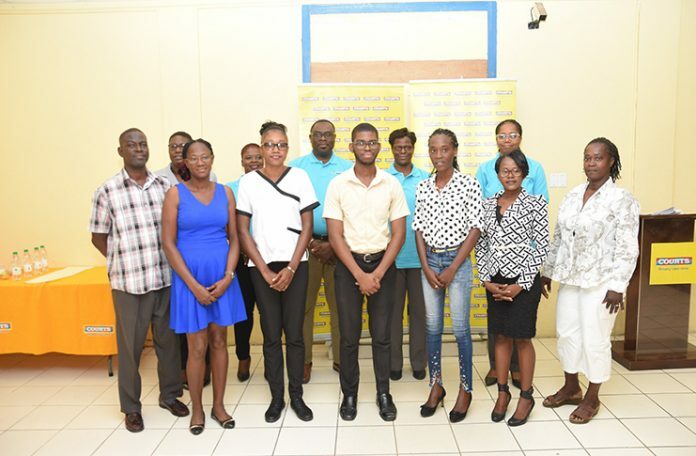 COURTS Guyana Incorporated on Wednesday awarded full scholarships to four University of Guyana (UG) students through its annual scholarship programme. The awardees are: 20-year-old Jeremiah Duncan, studying Business Management; 24-year-old Cristal Thomas, studying Civil Engineering; 25-year-old Udellie Haynes, studying Physiotherapy and Asher Marks studying Business Management. ‘’Courts is celebrating its fourth annual scholarship programme today and when it comes to education, we pay very keen attention to it and in helping students to achieve their goals, especially those who are subsequently studying and working very hard to be successful, because education is the key and determination that’s why we provide this programme, to help students accomplish that ’’ Roberta Ferguson, Digital Marketing Officer of the company said. Courts Customer Experience Manager Shonelle Bacchus, said that this year is very different,because normally they would select only three awardees, but they selected four. Guest speaker Samantha Monica Brown, who was one of the awardees in the previous year and who is a continuing student in the law programme at (UG) said: “It’s a privilege to say that I am a continuing student of Courts scholarship programme. As a student, I can attest to the fact that it is very liberating to be able to pursue a study and not have to worry about any tuition fees and to Courts I say thank you…”. She added that gratitude is a parent of all and her fellow awardees should show Courts gratitude by striving for excellence and make the most of the opportunity that they are receiving.